Who can say where my recent craving for a pair of leopard print smoking slippers/loafers originated from? Perhaps the desire was born somewhere in my subconscious. (Where is Freud when you need him?) But who knows? One day I just found myself desiring a pair of fierce leopard flats and justified my future purchase with the thought of adding an essential basic to my burgeoning collection of shoes. 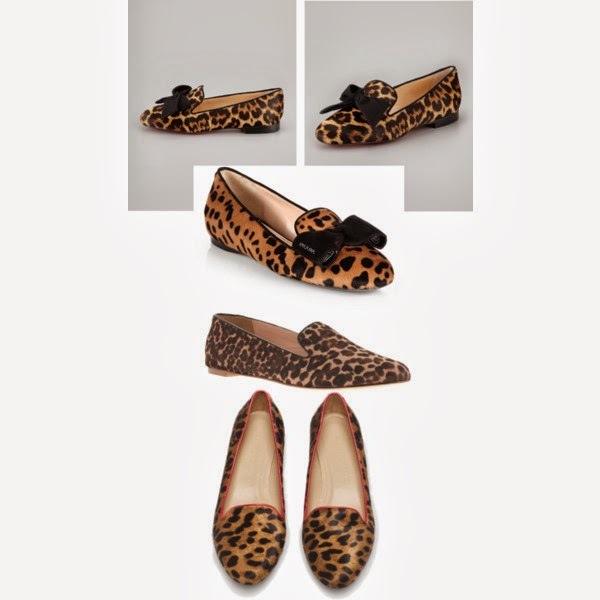 I thought I would be able to satiate my appetite for leopard with the following loafers featured below. These bowtie loafers are from Anthropologie, but sold out even in pre-order from their website, so I opted to purchase directly from the shoe company's website, Maraisus.com. Thinking I got a good deal by not paying tax or shipping I was soon disappointed upon unleashing these leopards from their cage (box) when they arrived at my doorstep. Are they super cute? Yes! Leopard print with a satin bows? Awesome! But despite the cute exterior of these flats, like a baby leopard with its big eyes and unassuming grin, they are not what they appear. These bowtie loafers from Marais US ended up being way too small in my regular size and I suspect if I did size up, judging from the stiff material and sole, they would be massively uncomfortable. As a result these shoes are now packed up and ready to be shipped out tomorrow. Now I am on the hunt again. Below are the "victims" I am considering. The nice thing is unlike my Marais US shoes, these shoes are all made in Italy. I am pretty sure that I am not going to pop for the Louboutin's or Prada's this time around unless they go on sale because I'm not sure how long my leopard lust is going to last, but what do you think? Are there any other leopard slippers or flats on your radar that I should know about?